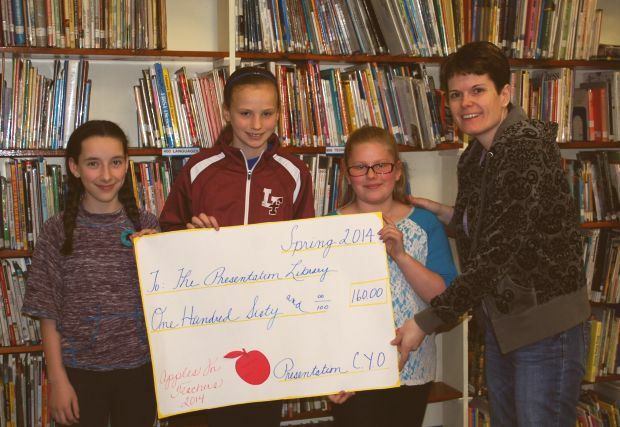 Presentation School students give librarian Kim Szypula, far right, a check for $160, which the students helped to raise in January. During Catholic Schools Week last January, current and former students of Presentation B.V.M. School in Cheltenham donated $1 to buy a “Thank a Teacher Apple.” Each paper red apple had hand written notes to teachers past and present from their students. In addition to students giving back to their educators with kind words of gratitude, they are also giving back to the school. All the proceeds from the apples go to the school library. The fundraiser has been running for several years at the school, and this year it raised $160.